Feeling like you’re in a midlife funk? Say goodbye to feeling stuck, frustrated and stagnant. Coaching with me means you’ll stop watching your life pass you by and start taking action with confidence. You’ll find the meaning you’ve been looking for. You’ll stop thinking about what you CAN’T do and fall in love with what you CAN do. Let’s figure out what you want. It’s time for you to get excited about your life again. Wish you could stop being stuck and fearful about making the changes in midlife you're dreaming about? You’re not alone. Sometimes it feels like an uphill battle. The 50 UNPLUGGED! Mastermind is exactly what you’re looking for when you really believe you’re older and wiser and ready to finally put your own needs on the priority list for a change. It’s all about celebrating opportunity. It’s about unplugging from the stereotypes about what you can’t do because of your age, kicking fear to the curb and confidently focusing on what you CAN do regardless of how old you are. It’s about possibility, growth, excitement and freedom. How great is that? And the best part? You get to be part of an amazing community of women who want the same thing. 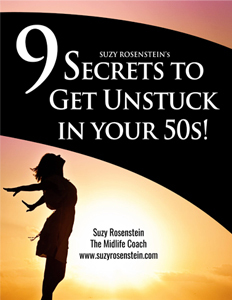 Learn more about this unique and totally fun year long coaching experience for women who are turning 50 or in their 50s and are committed to getting excited about their lives again! You’ve waited long enough. It’s time to celebrate opportunity in your 50 Unplugged life! 9 Steps to Regret-Proof your Life! Can you relate? You’re feeling stuck. Like you’re watching your own life pass you. You’re just going through the motions of life and you can’t take it anymore because you’re sensing you may have regrets. You’re ready for MASSIVE ACTION. You know it won’t happen over night, but you’re ready. You know deep down that you need help to get going. It’s time to regret-proof your life. Regret-Proofing IN ACTION is all about getting excited about your life and embracing accountability. You’re ready to honor your commitment to yourself. This 6 month private coaching program will help you get unstuck and regret-proof your life so you’re excited about your plans. You will change your life and be in awe of your newly found confidence. In fact, you’ll wonder what took you so long. Buckle up – there’s some serious action about to take place! It’s time for you to say goodbye to feeling stuck and overwhelmed when it comes to your online business or side-hustle. You want promote yourself and get “out there” but you’re confused about your niche and how to talk about what you do and who you help. This six-week program will help you get clear, get excited and get UNSTUCK so you can finally start helping people and making some money! As a Certified Authentic Selling® Instructor, I can't wait to help you see the results you've been hoping for! Stop spinning already and Unstick Your Biz!